A six-foot-wide snow blower mounted on a tractor makes a lot of sense when you live on the Tug Hill plateau. Tug Hill, in upstate New York, is one of the snowiest places in the eastern U.S. and experiences some of the most intense snowstorms in the world. This largely rural region, just east of Lake Ontario, gets an average of 20 feet of snow per year. 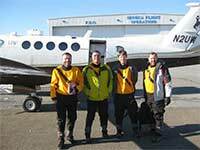 University of Wyoming researchers, with help from UW’s King Air research aircraft, were part of a study that found that these intense snowstorms are fueled by a well-organized air circulation driven by the heat released by the lake. The shape of Lake Ontario affects the formation and location of this circulation and, thus, the heaviest lake-effect snow. The results, published in three papers earlier this year, show how the shorelines of lakes may help forecasters determine the impacts of lake-effect storms. Researchers included Bart Geerts, a UW professor and head of the Department of Atmospheric Science, and Jim Steenburgh, a professor of atmospheric science at the University of Utah. The research appeared in three papers in the July 2017 issue of the American Meteorological Society journal, Monthly Weather Review, which publishes research relevant to the analysis and prediction of observed atmospheric circulations and physics, including technique development, data assimilation, model validation and relevant case studies. The three articles are titled “The OWLeS IOP2b Lake-Effect Snowstorm: Shoreline Geometry and the Mesoscale Forcing of Precipitation,” “The OWLeS IOP2b Lake-Effect Snowstorm: Mechanisms Contributing to the Tug Hill Precipitation Maximum” and “The OWLeS IOP2b Lake-Effect Snowstorm: Dynamics of the Secondary Circulation.” Philip Bergmaier, a UW Ph.D. student from Sadsburyville, Pa., was lead author of the latter paper, Geerts says. The region’s massive snow totals are due to lake-effect snowstorms, which are bands of snow resulting from warm lake water fueling intense, long-lasting storms. Lake-effect snow is common in the Great Lakes region and in areas downwind of large bodies of water, including the Great Salt Lake. Lake-effect storms begin when a cold mass of air moves over relatively warm water. Heating and moistening of the atmosphere destabilize the air mass. Unstable convective cells are amassed by cross-lake air circulation that starts with land breezes that strengthen at places where the coastline bulges out into the lake. The circulation drives a narrow snow band that persistently dumps its moisture as snow on a narrow strip of land downwind of the lake. Steenburgh says it’s long been known that breezes coming from the shore onto the lake help initiate and direct the formation of snow bands. In 2013, Steenburgh and Geerts, and colleagues from universities in Illinois, Pennsylvania and upstate New York, traveled to Lake Ontario as part of an NSF-funded project called the Ontario Winter Lake-effect Systems (OWLeS) campaign. While Geerts’ team flew the Wyoming King Air research plane through winter storms, Steenburgh and his students set up weather monitoring equipment, including profiling radars and snow measurement stations, to monitor the arrival of lake-effect storms near Tug Hill. While there, they witnessed the region’s intense snowfall, including one storm that dropped 40 inches in 24 hours. Often, snowfall rates exceeded 4 inches per hour. The Wyoming Cloud Radar aboard the King Air plane saw an intense secondary air circulation across the main snow band. “This circulation had a narrow updraft, creating and lifting snow like a fountain in a narrow strip that dumped heavy snow where it made landfall,” Geerts says. Using a weather model, Steenburgh’s team found that this circulation was thermally driven. The team also found that it originated in a land breeze generated by the lake’s shoreline geography. In some cases, another land breeze generated a second snow band that merged with the first. One particular shoreline feature is a gentle, broad bulge along the southern shore that extends from Niagara Falls on the west to Rochester, N.Y., in the east. Steenburgh says the residents of the region take the heavy snowfall in stride. Roads are kept plowed, and the team found that, many days, the biggest challenge was just getting out of the driveway of the house at which they stayed. Once the tractor-snow blower was fired up, however, the team had a clear shot. Steenburgh says that incorporating considerations of shoreline geography in weather forecast models can help better predict which communities might be most affected by incoming storms. Understanding the effect of breezes that arise from the shore shape is key, he says. “If we want to pinpoint where the lake-effect's going to be, we're going to have to do a very good job of simulating what's happening along these coastal areas,” Steenburgh says.